The Dexter 4215 fish knife is ideal for outdoor use with fishing, hunting, and camping. Constructed of high-carbon steel, the 5-inch blade is extremely durable for commercial use. The edge is individually honed and ground for optimal sharpness out of the box. The handle on the Dexter 4215 fish knife is made from walnut wood with a scored pattern that creates an easy-to-grip surface. Brass compression rivets attach the handle to the blade for a secure fit. "This knife is good for meat and fish weather at the cabin or in the field. Because it is carbon steel it will rust but will take a hair shaving e..."
"GREAT HUNTING KNIFE SUITED TO GAME PROCESSING AND GENERAL CAMP CHORES. NOT MEANT FOR HEAVY DUTY CHORES. WITH THIS KNIFE AND A HATCHET YOU COULD L..."
"i am using this knife for processing deer meat." 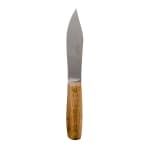 "This knife is good for meat and fish weather at the cabin or in the field. Because it is carbon steel it will rust but will take a hair shaving edge. The best use for this knife is butchering or cleaning animals or camp chores in general." "GREAT HUNTING KNIFE SUITED TO GAME PROCESSING AND GENERAL CAMP CHORES. NOT MEANT FOR HEAVY DUTY CHORES. WITH THIS KNIFE AND A HATCHET YOU COULD LIVE BACKWOODS. I HAVE SEVRAL/"